Trailer Swift Photo Booth rental for parties, wedding receptions, corporate events, school functions, university parties, fundraisers, concerts, festivals and more! A completely unique experience, not just your average photo booth. What is a 'Trailer Swift', exactly? Trailer Swift is a vintage 1954 Fleetwood camper trailer gutted and refurbished into a self-contained, mobile photo booth. 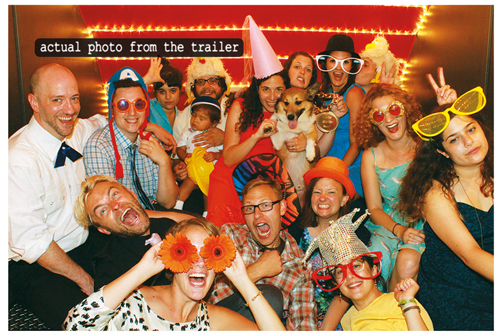 Trailer Swift was created by Chris and Luke, owners of Redlight Photobooth based in Columbia, Missouri. Why a trailer? Why not just keep with the original photo booths? We definitely still keep with our regular line of photo booths through Redlight Photobooth. Trailer Swift is our new, exciting project that is unlike anything else in the area. It has a lot of features that a regular photo booth is unable to provide. The trailer is resistant to weather: wind causes photo booth curtains to sway, sunlight causes unwanted shadows and effects, etc. Trailer Swift has limo-black tinted windows that create an environment for perfectly lighted photos. Trailer Swift is a fully-contained photo booth. Guests simply step in and get cozy on the couch, they see themselves in a large monitor opposite of them. They begin the sequence with a large button on the wall. The screen automatically counts down and snaps photos of the guests in their wacky poses. When the sequence is over, it automatically prints a copy for the guest within 15 seconds which is retrieved outside the trailer. That's it! It is automatically ready for the next group! Trailer Specs, will it fit at your event? Sample printout from the trailer. We can customize your print template however you wish! #HappyNewYear We look forward to a very fun and busy year! !